Faith (whelped 12/21/99) went to live with Mike and Laura Carpenter (Eclipse Dals) in 2001 and has worked her winning ways on Mike, “My dog is perfect”. 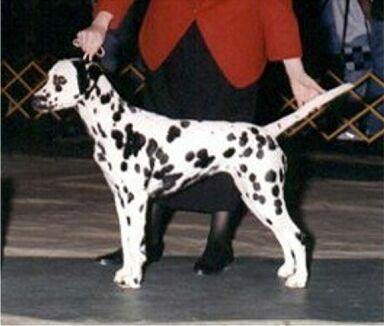 A lovely dog with enough bone without being heavy, dark pigmented markings, healthy coat, beautiful front and rear with good reach, superb down and back, and our trademark balance. We made the tough decision to let her go to Mike and have never regretted it.